These easy guacamole deviled eggs are the perfect appetizer for Game Day, St. Patrick’s Day, Easter and Cinco de Mayo! It’s the party eggs! 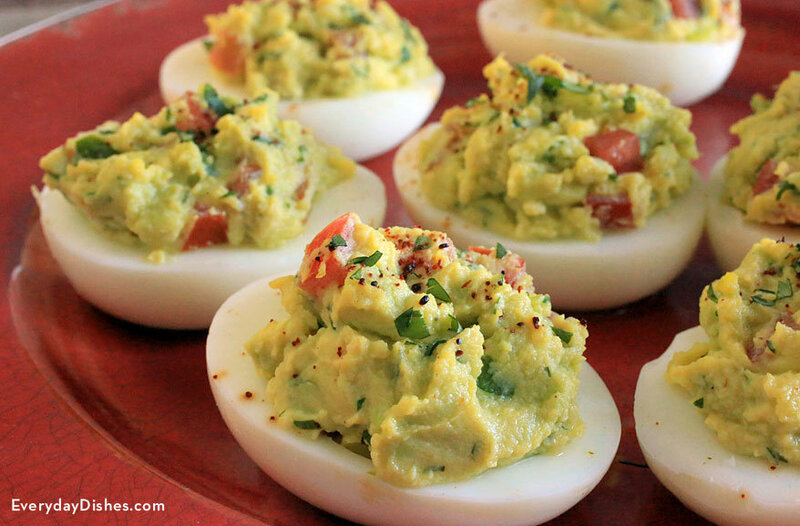 Yes to guacamole deviled eggs! We’re obsessed with easy deviled egg recipes and with brunch season in full swing, we can’t get enough of delicious deviled eggs. After being inspired from this cool deviled egg bar, our culinary ideas started rolling with so many different ways to spice up and devour deviled eggs. The key to making a great deviled egg recipe, regardless of what you put in it, is that the center yolk filling must be creamy. Sure, maybe you can have a few lumps here and there, but having a consistently creamy and tangy/flavorful filling is what makes a good deviled egg, GREAT. 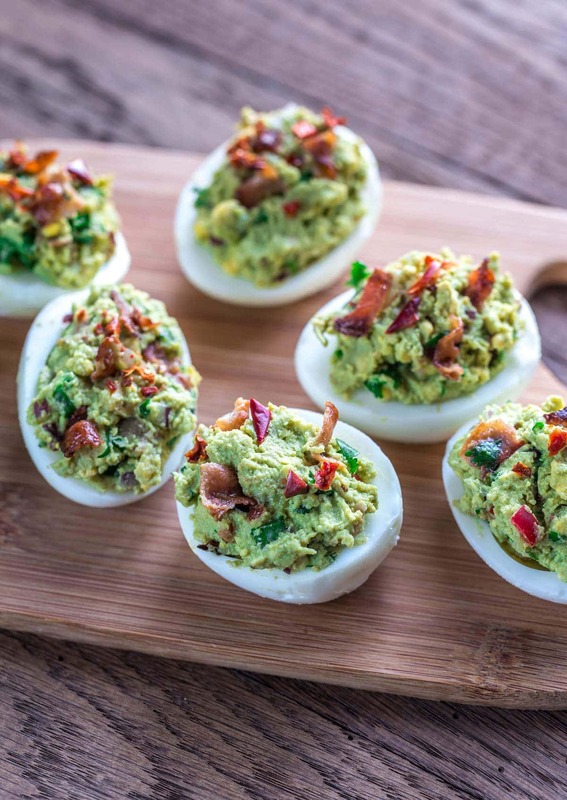 What you get is a truly amazing bite of so many things you love in guacamole and deviled eggs combined together. 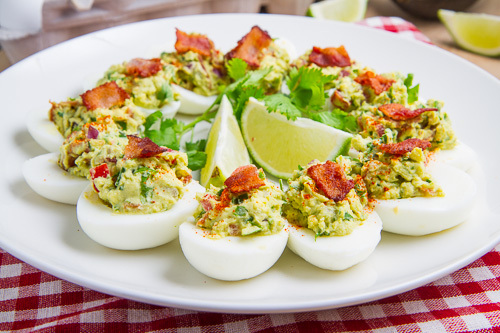 Truly, it was a hit when we presented a huge platter of these gorgeous guacamole deviled eggs at a party. It was hard to not eat 2-3 per person and we ran out of them so fast. But no worries, because they’re so easy to make. These yummy deviled eggs are also great for cinco de mayo or any game day that needs a fantastic appetizer. Maybe add a bit of salsa on top and everyone will be super happy! For an easy to peel hard boiled egg tips, see our post here: Easy to Peel Boiled Eggs. Cut boiled eggs in half lengthwise and remove yolks. In medium bowl add 2 egg yolks and the avocado. You can save the remaining egg yolks for other recipes. Add fresh lime zest, lime juice, smoked paprika, cilantro, and/or chili and hot sauce. Season with salt and pepper, to taste. Mash the yolk and avocado mixture into a smooth texture. Taste the mixture and add additional salt and pepper, if needed. Using spoon or piping bag filled with the guacamole/yolk mixture (a quart-sized zip-lock works great too-just snip the corner after filling), evenly disperse the mixture into the egg whites until it’s full and heaping. Add your favorite toppings and serve chilled.